For more simple, yesteryear-inspired action you’re after, check out the best indie games on PC. If you’ve ever played DMA Design’s now infamous pre-Grand Theft Auto masterpiece, you’ll likely agree it can be tremendously unforgiving. And yet, to look at its characters – cutesy, spritely anthropomorphic interpretations of rodents, dressed in ill-fitting blue robes with messy lime green hair and vacant expressions – the first thought that generally springs to mind is: awww. 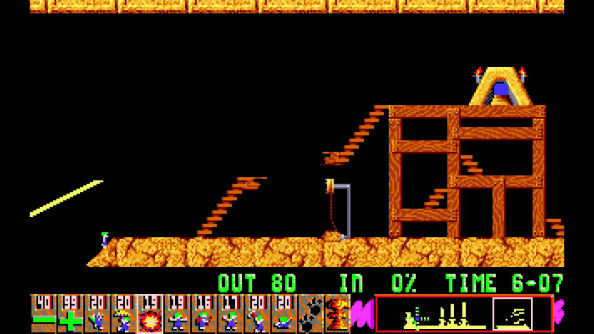 While the aim of the game is to save as many as one hundred of these little fellows at a time, Lemmings is designed in such as way that survival often becomes a rarity. In 1984, aged just 14, Dailly was coerced by a friend to attend the local Kingsway Amateur Computer Club in Dundee – a chance occurrence he reckons went on to “change his life forever”. There he met three budding computer enthusiasts named Russell Kay, Dave Jones and Steve Hammond – all of whom he’d eventually work alongside. At the time, Jones had just parted ways with Timex and with his redundancy money had purchased a then state-of-the-art Amiga 1000. Aside from being rare in those days, the Amiga’s technical capabilities far outshone the Commodore 64s and Sinclair Spectrums most folk owned instead. At the club, Jones quickly became the centre of attention and attracted the interest of Dailly, Kay and Hammond. Three years later, Jones launched DMA Design, and called on his mates to join him. The three years that followed that saw DMA find its feet in the industry as it launched debut venture Menace and indirect follow-up Blood Money. Both games were side-scrolling shooters and were heavily inspired by the alien-blasting, power-up-grabbing sci-fi fare that drove the industry at the time. 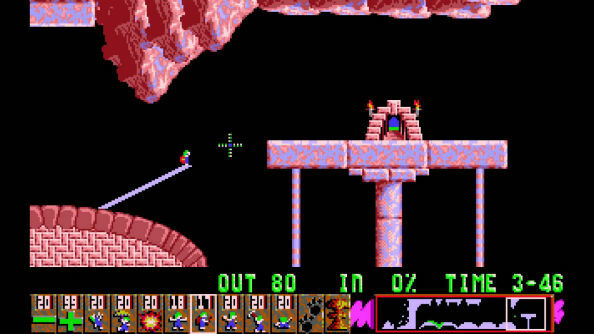 In 1990, the aforementioned sprite-killing conversation took place and the foundations for Lemmings were put in place. The premise was simple: guide a predetermined amount of up to a century of critters from one end of the screen to a goal at the other. Besides the roles you’d be able to ascribe yourself, the lemmings move autonomously, normally following each other. With a multitude of traps adorning each level, quick thinking and timely strategy would be essential – particularly in later stages. 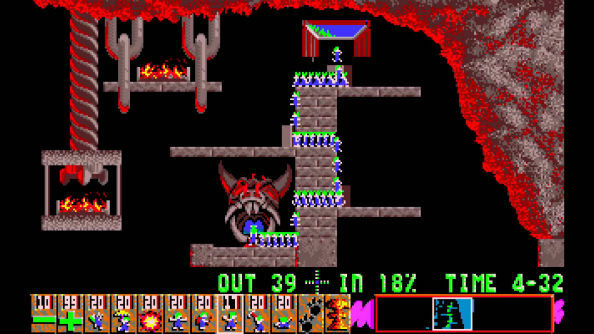 Climbers, floaters, blockers, builders, bashers, miners, diggers and bombers marked the special abilities lemmings could adopt within levels that at times demanded the services of all eight variables at once. 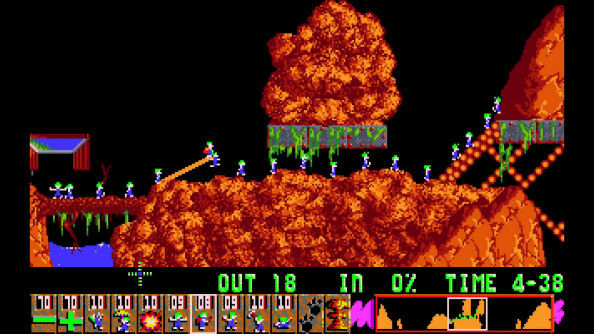 Inspired by a technique he’d learned while tinkering with the Amiga’s Deluxe Paint program, Dailly produced an animation that showed the lemming sprites moving endlessly. This galvanised the decision to restrict player input, besides assigning jobs, as it meant the sprites were always headed in one direction, lest you step in. Levels were also set against a Deluxe Paint interface which allowed the entire DMA team to design their own. As you might expect, producing levels quickly became a competition to see who could come up with the most challenging/frustrating/brutal/all of the above. In conjunction with the eight jobs, not to mention the heinous traps Dailly et al decorated each setting with, the possibilities were almost endless. And if you realised you’d messed up at any stage, a part-convenient-part-sadistic ‘nuke’ feature was deployable. Hit nuke and suddenly a five second countdown appeared above each lemming’s head before they covered their ears, muttered “oh no!”, and exploded; blowing chunks out of the landscape as they went. Dailly recalls Jones’ love of Defender and the way the ships exploded as why this function made it into the game. When team member Brian Watson first saw the animation, says Dailly, he fell backwards off his chair in a fit of hysterics. “We just wanted to make something fun,” says Dailly. “Dave made an amazing level editor that allowed for very rapid level development, and we just had fun with it. The complexity was purely a result of us getting better and better players, and level designers. “[It’s not] like we were carefully trying to fit a level into a specific grading. We [weren’t], we tried to make the hardest, most tricky level we could. Obviously this meant some were harder than others. We had amazing fun doing this, trying to beat each other’s levels. This was basically impossible. We were expert players that could solve pretty much any level in seconds. 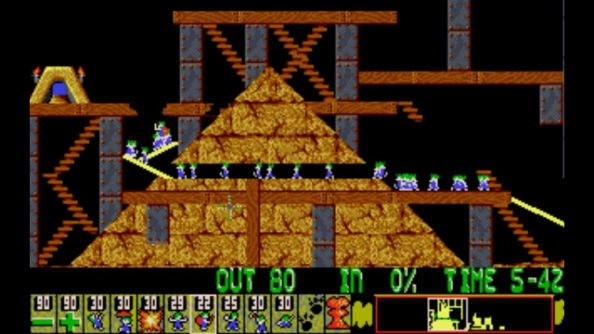 Even with such large amounts of individualised iteration, Lemmings itself remained fairly constant in its design. Beyond the gruesome and hilarious death, at its heart is a game about saving these creatures – you’re tasked with getting them safely from one checkpoint to another, and are simply asked to satisfy criteria laid out quite explicitly before the beginning of each level. If you fail, well, that’s on you. No matter how many traps, winding levels, head-scratching puzzles, there is a way to succeed and it’s just too bad if you can’t work it out. Entertaining that simple premise may well cause loss of sanity, loss of hair, or loss of sleep – as marked by the game’s own box – but it’s constant nevertheless. 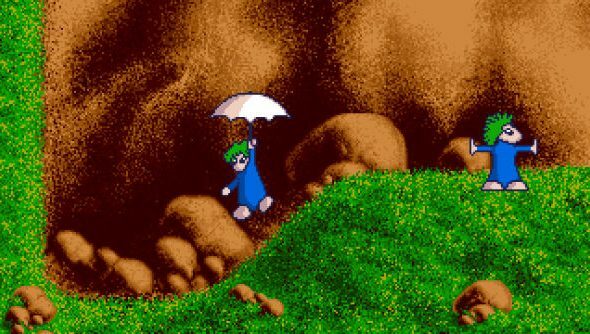 Perhaps the most wonderful thing about Lemmings – besides that feeling of euphoria gained by finally realising how to salvage 100 percent of your litter even when you need to employ blockers – is its soundtrack. 21 chiptune mash-ups that include seemingly incongruous mixes of Here Comes the Bride and the Death March will haunt you for hours, days, weeks, even years after playing (I for one can confirm this) and almost – almost – made the suffering endured during its Mayhem setting’s The Steel Mines of Kessel or Save Me levels bearable. 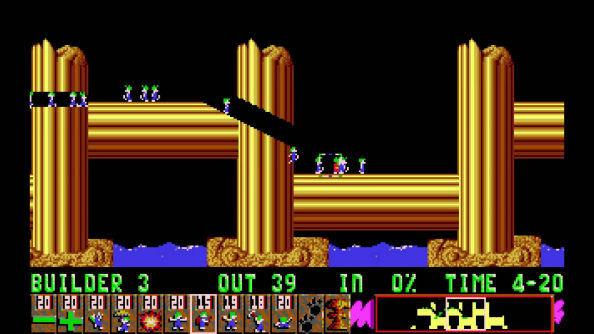 As it happens, the music that featured Lemmings was finalised as a result of necessity, not choice. “We originally started with ’60s TV theme tunes,” explains Dailly. “Mission Impossible, the A-Team, that kind of thing, but this was about the time copyright in games was starting to be noticed. You could no longer just rip something off and expect to get away with it. So the idea was to use music that was out of copyright. While lawsuits are the last thing a games studios wants post-release (although DMA would have bigger fish to fry further down the line following the release of their highly controversial Grand Theft Auto), the success of Lemmings upon launch might’ve softened the blow. On its day of release, Valentine’s Day 1991, Lemmings shifted 55,000 copies. Critically, it received scores of positive reviews which meant the demand for ports to platforms beyond the standard Amiga, Atari ST and PC sky rocketed. 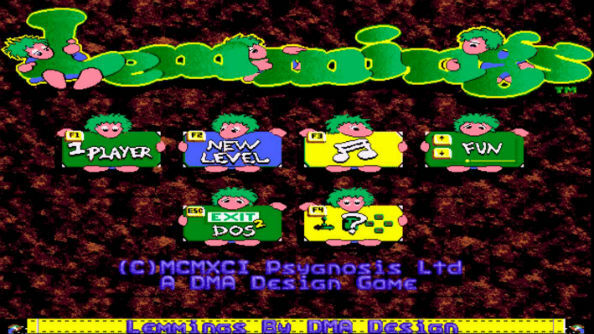 Today, Lemmings has appeared on almost every platform imaginable. It’s received countless sequels – the best of which is most likely immediate successor Oh No! More Lemmings – including holiday spin-offs and 3D interpretations. To this day, it’s estimated to have sold over 15 million copies worldwide. Which is not bad going for a team that began life at hobbyist computer club in Dundee some 30 years ago. “I believe it was a combination of funny and fun,” offers Dailly as to why Lemmings achieved such success. “It was great to progress and see the little guys getting killed in new and interesting ways, and the fun you got trying to solve the level was massive, addictive even. Every mistake you made, you knew it was your mistake, and not the game not playing right. This drove you to try again and again. “The characters were cute, the deaths spectacular, and the puzzles fiendish. What more could you want from a puzzle game? It certainly did put ‘freedom’ into Dave’s mind. From [Lemmings], Body Harvest was spawned, then GTA. Open world, but more importantly the freedom to choose how to play a level.